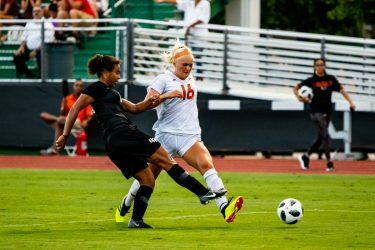 The Miami Hurricanes soccer team has seen a big turnaround this season, boasting a record of 8-5-0 and 3-2-0 in conference play. Thanks to specific routines and unique collections, senior forward Gracie Lachowecki and redshirt sophomore goalkeeper Phallon Tullis-Joyce have led the charge for the Canes. After upsetting No. 2 Virginia and Syracuse in the same week, Lachowecki and Tullis-Joyce garnished ACC Offensive Player of the Week and ACC Co-Defensive Player of the Week honors, respectively. Lachowecki totaled two goals to help the Canes to a perfect 2-0 week, while Tullis-Joyce tied a career high with six saves along with her sixth clean sheet of the season. Being named ACC Player of the Week isn’t the only thing these phenoms have in common. Both picked up the sport at about the same age. Lachowecki’s father, A.J. Lachowecki, played for the University of Evansville and then spent seven years as a pro in the Major Indoor Soccer League. Her brother, Max Lachowecki, was a four-year starter at Notre Dame and was picked in the second round of the 2016 MLS SuperDraft by Real Salt Lake. Tullis-Joyce also began playing soccer around the same age. 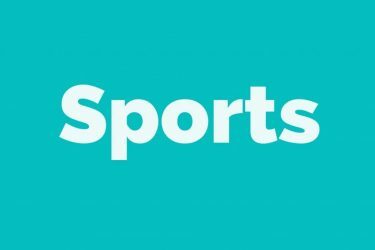 “I started swimming when I was nine months old, but I wanted to try something different and soccer was pretty big in New York, so I picked it up when I was four,” Tullis-Joyce said. Lachowecki and Tullis-Joyce have been exceptional for the program, and their success has come with hard work to overcome challenges along the way. As student-athletes, both have to manage the workload that comes with being a college student on top of their soccer schedule. Along with waking up early for team practice, attending meetings and watching film, they’re still expected to keep up the same high standard of academics on a daily basis. 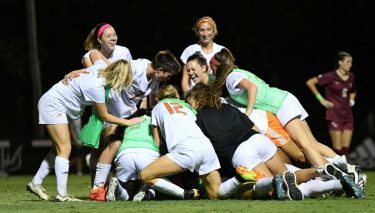 Lachowecki, who is tied for third place on Miami’s all-time goals list with 22, often uses time in between classes to have one-on-one training sessions with the coaching staff for practices that she can’t attend due to the rigorous academic schedule that comes with being a nursing major. Still, the forward from Evansville, Indiana, and the goalkeeper from Shoreham, New York, have received numerous accolades for their hard work on and off the field, including Second Team All-ACC, All-ACC Academic Team, NSCAA College Player of the Week and ACC Honor Roll. Their reasons for coming to the University of Miami stretched much beyond the 75-by-120 yard turf field. Lachowecki, who hopes to become a nurse and work in pediatrics after college, chose Miami because it offered something unique to any other school in the country. “I definitely wanted to major in nursing and also play in the ACC because it is the toughest conference for women’s soccer, so Miami was pretty much the only school that let me do both,” Lachowecki said. Tullis-Joyce, who likes to snorkel in her free time, wanted to further explore her interest of marine life while also continuing her soccer career. While these two soccer superstars may appear like your typical college students, Lachowecki and Tullis-Joyce have their own unique quirks. Their personalities even springboard into their soccer routines. With the Canes’ winning big games, Lachowecki and Tullis-Joyce look to continue the success with the ultimate goal of attaining a NCAA tournament berth. “I want to keep the winning streak going and make the NCAA tournament,” Tullis-Joyce said about her goal for the season. Miami will look to continue climbing up the conference table as they visit ACC-foe Pittsburgh at 1 p.m. on Sunday. Josh White can be reached on Twitter at @joshwhitesports.